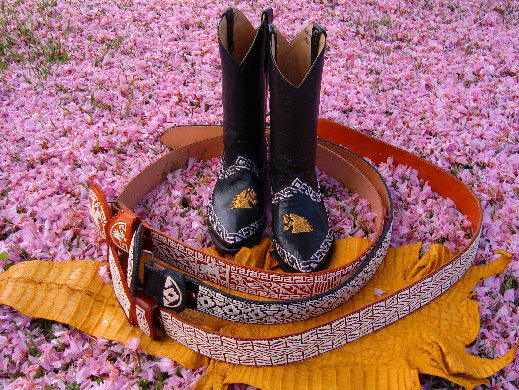 While others are only just leather shops copying our innovations OBREGON CORP. is a well organized leader group in cactus thread elaborations, which counts whit plantations of cactus fiber production and boots factory to supply any order, elaborating every day effective and faster’s production processes to gives the best price with good quality. Encourage, Promote, Protect and improve the works made from Cactus thread embroidered by hand in leather, an art craft lately almost forget it because wrong projections and unfair commercials handles done before this new information age taking everybody concern with this original art craft outside of a really good fight back position, and without good options to face the new commerce challenges. Artcraftmen from Guatemala, Costa Rica, Colombia Mexico or China need to restructure from inside to guarantee stay financial healthy in it as a business. One of the reasons to development this web site were with the main idea to clear up a lot of "Fairly tales" Myths and lies around this kind of gently hand made art-work embroidered with original cactus thread fiber obtained from a variety of the "Agave Americana". If we show and teach how to distinguish works made by machine and some others that although are hand made embroidered the thread used in the embroidered is cotton. We came seen for long ago how hard it is sometimes to our dealers in their stores to proof and convince the final customer they are buying an original and genuine item made of Genuine leather embroidered with original Cactus Thread because there is a bunch of counterfeit and good copies involved in the same market, made of others materials that look as those originals and genuine materials, our target is give to those dealers that proudly carry our items with our logo on their stores with the good quality and the best prices some smart facts as a reference to avoid this kind of confusing which is making a parallel market of counterfeit on some similar items. The productions facts are very important to us as a company as well as the preservation and search of good customers. However the human Facts are always our Priority. We take care of every single point in our items productions lines even when those items are still only simply drawings, we take our time in the selection of the best prime materials to assure the personal, professional and economical grow of all our human resources teamwork, our investors, advertisers, commercial partners, actionists, customers and every SINGLE person inside and around OBREGON CORP. Is very important to us. Consolidation as the leader company on the top of the PITEADO- Western fashion innovation, and the implementation of new materials in our designs to always offer innovative products with good quality at insuperable good price to our whole sale - dealers customers seeking to satisfied together the latest needs and demands of our final customer. In OBREGON CORP your business is very important to us and we look no matter what to protect and take care of it, because they are the front desk presentation of our art work. DO YOU REALLY WANT TO SEE WHO WE ARE?.